FILE - An employee arranges stools at a section displaying Haier television sets inside a Suning store in Shanghai. In this latest installment of our series on What Americans Think About China and Chinese Americans, reporter Michael Lipin looks at U.S. consumer attitudes toward China-made products - especially those representing Chinese brands, which are becoming more visible in American stores and popular culture, but have struggled to earn substantial consumer loyalty. Chinese brands are having a tough time gaining recognition in America, where many U.S. consumers cannot identify them. Those consumers include a couple in their 20s, who were shopping recently at a warehouse in Arlington, Virginia. "I’m trying to think of an actual Chinese-branded product and I can't really think of anything," said Patrick Hamilton, after coming out of the Costco branch in Pentagon City. His partner, Sarah Friedman, also was baffled. "I can't think of a single one," she said. Neither could several other shoppers who also had visited the wholesale club, which sells Chinese-branded items such as LED HDTVs from TCL and Hisense. But Hamilton said he was aware that many consumer goods sold at stores such as Costco are Chinese-made. "You hear that Apple products and other things are 'Made in China'," he said. "I pretty much just know the 'Made in China' brand," added Friedman. China is the largest source of imports to the United States, but two 2013 surveys of U.S. consumers by marketing company Millward Brown and e-commerce firm HD Trade Services showed that only six percent of respondents could name at least one Chinese brand. Doreen Wang, head of Millward Brown's global brand database BrandZ, says the main reason for Americans' lack of awareness is that many Chinese companies are in the early stages of marketing their brands to those consumers. "Putting Chinese-branded products into U.S. stores does not mean that you have established a brand in consumers’ minds," Wang said. "You need years of effort to accumulate 'brand equity', which is a measure of how well consumers know the brand and how much they love it, want to use it and recommend it to their friends." FILE - WeChat hopes to expand its mobile communications service in the United States. Chinese mobile phone messaging app WeChat is one example of a recent Chinese-branded entrant to the U.S. market. With 468 million monthly active users around the world, WeChat is one of the biggest international social networks. But, it only began researching how to promote itself to Americans last year. Other companies making initial attempts to woo U.S. consumers include one of China's most prominent jewelers, Lao Feng Xiang Jewelry, which opened its first U.S. outlet in New York in February, and China's Hainan Airlines, which began flying to its third U.S. destination in June, adding Boston to its Seattle and Chicago routes. HD Trade Services says some of the recent Chinese entrants to the United States have struggled to market their brands effectively. Poor sales prompted Chinese sportswear maker Li-Ning to close its only U.S. retail outlet in 2012, two years after opening it. Li-Ning also shut down the e-commerce section of its U.S. website last year. Many of China's biggest companies have been focused on establishing a strong brand identity at home rather than trying to appeal to Americans. Wang identified three notable examples, including China Mengniu Dairy, the country's largest dairy company, New Oriental Education & Technology Group, the largest Chinese provider of private educational services, and JD.com, the top Chinese direct sales e-commerce provider whose business model is similar to U.S. giant Amazon.com. Jessica Vaughn, a writer for U.S. marketing research group JWTIntelligence, says another reason for the low Chinese brand recognition is that China served as an original equipment manufacturing hub for foreign brands for much of the 20th century. "It has only been in recent years that Chinese companies have started to focus on building multinational brands of their own," she said. Some Chinese companies also have chosen to acquire American-owned brands and keep the original brand names rather than market their own names to U.S. customers. In one such acquisition, China's Geely Automobile bought the Volvo Cars division of U.S. automaker Ford in 2010 and retained the Volvo brand. A few Chinese brands still have managed to make their presence felt in the United States, according to data compiled by Millward Brown, HD Trade Services and JWTIntelligence. ​Computer maker Lenovo and appliance maker Haier feature prominently in the lists of the most recognized Chinese brands among Americans. "Technology companies are the ones paving the way for Chinese brands in the U.S. market," said Vaughn. "They are creating novel products that can compete at or above a world class level, and they are doing this by investing heavily in research and development." 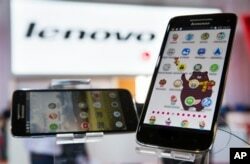 FILE - Lenovo shows its Vibe X smartphones at a trade fair in Berlin, Sept. 5, 2013. Originally headquartered in Beijing, Lenovo bought U.S. computer giant IBM's PC division in 2005 and rebranded it as 'Lenovo'. Since then, the Chinese company has become the world's largest PC manufacturer. Lenovo spent $732 million on R&D in the fiscal year that ended in March, up 17 percent from the previous year. Qingdao-based Haier, the world's top appliance brand, has drawn attention in the United States for innovative product features that cater to American tastes, such as a refrigerator with a pizza-sized drawer and a compact refrigerator suited to students in small college rooms. Haier also unveiled an ultra-thin transparent TV screen and a "Brainwave" TV designed to be controlled with a user's mind at the International Consumer Electronics Show in the western U.S. city of Las Vegas in 2012. FILE - Air China planes wait on the tarmac of the Beijing Capital International Airport. Another of the better-known Chinese brands in the United States is Air China, the country's flag carrier. BrandZ's Wang says Air China has focused on flying to more global destinations in recent years, especially in the United States and Europe. Washington became Air China's sixth U.S. destination in June, when the airline launched the first direct commercial flight between Beijing and the U.S. capital. "They also invested a lot of effort in brand building, positioning themselves as an 'eastern beauty' with an oriental style rather than a traditional Western way of in-flight service," Wang said. Despite such innovations, U.S. consumers' most common impressions of Chinese brands are negative. Those China-made products account for about one quarter of U.S. consumer spending on goods and services produced abroad, according to a 2011 study by the U.S. Federal Reserve Bank of San Francisco. The report said the imported Chinese goods consist mainly of clothing, shoes and durable items such as furniture and household equipment. A 2012 survey of U.S. adults by marketing research group JWTIntelligence found that prevailing attitudes toward Chinese-branded imports were negative, with respondents most commonly describing them as 'mass produced', 'cheap', and having 'poor' safety standards. Doreen Wang, head of U.S. marketing company Millward Brown's global brand database BrandZ, says those impressions originate from the stigma that many Americans associate with phrase 'Made in China'. "U.S. impressions of Chinese brands have been shaped by many years of consumers perceiving anything 'Made in China' as being cheap and having quality challenges, and that has hurt Chinese brand-building," she said. Wang says Americans typically "cannot separate" their opinions of Chinese-branded products from their general feelings about China-made products of any brand origin. Jessica Vaughn, a JWTIntelligence writer, says Chinese manufacturers earned a bad reputation in the United States after decades of exporting poorly-made, unsafe and forged products. "So now there is a really tough environment for Chinese brands that are seeking to expand internationally," Vaughn said. 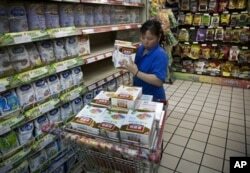 FILE - A worker removes boxes of Yili infant milk powder from a Beijing supermarket’s shelves during a product safety recall in June 2012. Vaughn says the reputation of China's brands also has suffered because of product safety complaints from domestic Chinese consumers. Contaminated food scandals in China have made international headlines in recent years. In one case reported by foreign media in July, a Chinese TV station secretly filmed a Shanghai meat factory in which workers could be seen picking up meat from a dirty floor and throwing it into a grinder. The factory had been providing meat to Chinese branches of American fast food chains McDonald's and KFC, both of whom stopped using the supplier and apologized to Chinese consumers after the news broke. In 2012, Chinese dairy giant Yili ordered a recall of infant formula across China after authorities discovered elevated levels of mercury in the product. "Chinese manufacturers have to clean up their act at home in order to make it on the world stage, where there is much more competition," Vaughn said. "If they are not winning on their home turf, it is going to be even more difficult when they start to leave China." JWTIntelligence's 2012 survey also showed that several positive impressions of Chinese brands have emerged among some U.S. consumers. It said one-fifth of respondents aged 18-34 and 48-67 found Chinese brands to be "interesting," while nine to 20 percent of respondents in all age categories also considered those brands to be "well-designed" and "reliable." The image of Chinese brands in the United States has benefited from several recent developments. One is an effort by Chinese companies to clean up their safety record. "Chinese dairy makers Yili and Mengniu who both recalled tainted milk power in 2008 have partnered with international companies to adopt world-class production and supply chain practices," said Vaughn. Marketing strategies also have improved. Yili is one of several Chinese brands that have placed products in American movies and TV shows in recent years. Its Shuhua Milk carton appeared in 2011's Transformers: Dark Side of the Moon and in TV sitcom The Big Bang Theory in 2012. Some Chinese brands also have downplayed their country of origin as they reach out to Americans. Appliance maker Haier, based in the Chinese city of Qingdao, makes no reference to China on the homepage or 'About' page of its U.S. website. In a 2013 report on American attitudes toward Chinese brands, U.S. e-commerce firm HD Trade Services praised Haier's approach, saying there is nothing deceptive about it. "Haier has simply taken the approach that it is a multinational brand," the report said. Innovation also is helping Chinese brands to capture Americans' interest. In January, mobile phone maker ZTE used a Las Vegas trade fair to reveal a prototype of a modular phone that would allow users to buy and install camera and battery modules with varying levels of power. Vaughn says Chinese consumer technology companies such as ZTE and Haier have been investing heavily in research and development. "They are offering things that people have not seen before, and that is changing the perception that Chinese brands are just copycats," she said. The most positive opinions of Chinese brands or "Made in China" products tend to be held by American 'Millennials' aged 18 to 34, according to the JWTIntelligence survey. "A lot of American students who can't find jobs easily at home go to China to take advantage of its booming economy, while many Chinese students come to U.S. schools," Vaughn said. "So 'Millennials' are interacting with the Chinese on a daily basis and are more open than previous generations to the idea of Chinese brands." The Chinese-branded products most desired by the 'Millennials' who participated in the survey include video games, foods and beverages, appliances, electronics and clothing. ​The report showed that one-quarter to one-third of the 'Millennials' were interested in trying those products. But, it also found that many other types of Chinese brands drew lower levels of interest from U.S. consumers of all ages. Two studies published last year have shown that overall U.S. consumer interest in Chinese brands is relatively low. When asked: 'Would you buy a product if you knew the brand was owned by a Chinese company? ', only 68 percent of respondents to the HD Trade Services survey said yes, compared to 81 percent who said yes to buying a Japanese brand. In the other survey by Millward Brown, only 40 percent of respondents said they were very or somewhat likely to buy a Chinese brand. Many Americans also express a preference for U.S.-made products compared to those from China. A 2012 U.S. consumer study by business strategy advisory firm Boston Consulting Group found that 81 percent of the Americans surveyed were willing to pay more for products labeled 'Made in USA' versus 'Made in China'. Vaughn says that finding reflects a long history of economic rivalry between the West and China. "China is booming right now, and much of the West is still struggling with fiscal woes," she said. "So, for U.S. consumers, voting with your wallet for a 'Made in USA' product and paying a premium for it is a way to show that you want the American economy to revive." So what should Chinese brands do to change the negative impressions held by much of the U.S. public? BrandZ's Wang says they should focus on innovation. "Hopefully, Chinese brands will keep offering products that U.S. consumers perceive as innovative and simple to use. That will enable them to grow not only their product distribution in the United States, but also their brand equity," Wang said. Vaughn says that process has been slow. "But in our hyper-connected, globalized, fast-moving world, the journey from negative to positive consumer perceptions could be significantly shorter than it once was," she said.